Something, such as light, radiant heat, sound, or an image, that is reflected.Mental concentration; careful consideration. A thought or an opinion resulting from such consideration. An indirect expression of censure or discredit: a reflection on his integrity. 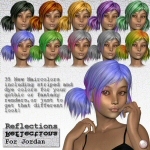 Presenting Reflections for Jordan; 10 Styles for the Jordan Clothing and 35 Color textures for the Jordan Hair for "Jordan for Aiko 3" by 3D Universe at Daz3D. All these textures are different and unique to reflect Jordan's moods or your own, from cute to seductive. Every texture for the clothes consist of one texture for the Tee and one texture for the Pants, great as a set, but why not combine the Tee with a pair of jeans for something special. 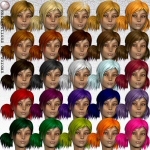 There are 35 hair textures in total, ranging from natural to fantasy colors and striped and dyed colors, so you have a lot of possibilities. Give Jordan a breath of fresh air, let her out to play, you know she wants to! Have a look at the pictures for all Clothing styles and more details, plus all hair options! Most of all, have fun! Requires Aiko 3 figure and Jordan.